Wow, you should NEVER leave the house without makeup. Ever. That wrinkle wasn’t there yesterday. You’re getting so old. You’re so fat it’s a miracle anyone likes you. You should be ashamed. Does your mirror whisper, too? After all, that’s what glossy magazine covers and rail thin TV and movie stars blare at us each day. If you don’t have a Barbie figure, Malibu tan, perfect teeth, flawless skin, billowing hair, pouty lips, perky breasts, and endless legs, somehow you are less than. His experience revealed a devastating lie that confirms what women (and men) today have been brainwashed to believe: Physical beauty = value. 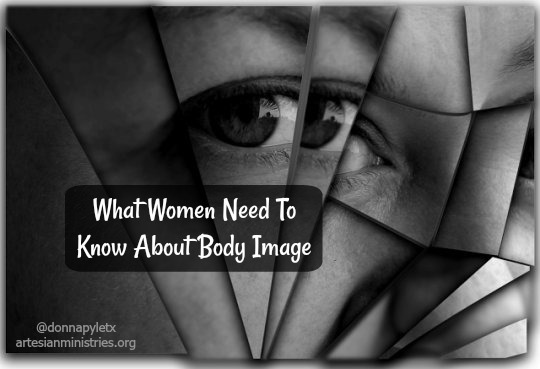 ~ 90% of all women want to change at least one aspect of their physical appearance. ~ 81% of 10 year old girls are afraid of being fat. ~ One out of four college-age girls have an eating disorder. 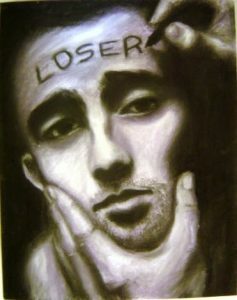 ~ Suicide is the third leading cause of death among adolescents and teenagers. ~ Only 2% of women think they are beautiful. The world’s obsession with physical perfection murders our self-esteem and mangles our self-worth. Now, don’t get me wrong. I know this fact about my physical appearance confirmed by doctors: I am overweight. But more importantly, I know this life-changing fact confirmed by Scripture: my Savior sees me as an immeasurable treasure for whom He sacrificed His life. Jesus, my family, and my friends do not value or love me based on my physical appearance. The One who created fields of vivid flowers, soaring mountains, and deep blue oceans created YOU. Not because He had to, but because He wanted to. And God does not create ugly. He created you to enter into a loving relationship with Him — to lavish on you unconditional love, extraordinary blessings, and gifts that never hinge on your dress size or complexion. Through the world’s eyes, physical perfection hisses destructive lies. Through God’s eyes, Christ’s perfection provides redemptive truths. Jesus, perfection made flesh, walked this earth and loved ALL — without regard to race, gender, age, mobility, social status or physical appearance. He demonstrated how to love others likewise and invited us to love Him. When Jesus voluntarily gave His perfect life to provide the certain hope for imperfect people to spend eternity with Him, He promised that we will be like Him. When you and I look to God for our identity and worth, we are radiant. BEAUTIFUL! He invites us to see ourselves through His loving eyes, not a culturally warped, photo-shopped magnifying glass. When I remember Mother Teresa, I don’t think of physical beauty. I think of Jesus. His love shining through her made her more beautiful than any super model on the planet. We have a generation of girls killing themselves — literally — to strive after physical perfection. Please do not pass up any opportunity to tell them that they are beautiful — not because of how they look — but because they are created in God’s glorious image that transcends outward appearance. A mirror’s reflection does not determine your worth because Christ’s perfect beauty reflecting through you makes you priceless. Thank you, Lord, for loving us beyond ALL worldly measures. Have you ever struggled with body image issues? How did you cope with or combat it? What wisdom can you share to help others? Some labels we like: Smart. Beautiful. Rich. Skinny. Successful. Some not so much: Stupid. Ugly. Needy. Fat. Lacking. But some labels go much deeper. Sometimes the adhesive leaves marks on our heart. Labels that cause us to lower our head. Avoid eye contact. They strike something so deep in us that we just want to run. From the stigma. From the memories. Childless. Widowed. Divorced. Abused. Abandoned. Failure. It doesn’t matter who attached the labels. Sometimes we adhere them on ourselves. Perhaps we switch them out depending on circumstances and mood. Or attitude. Or who we’re blaming. Or who we’re mad at. It’s easy to label others. It doesn’t cost us anything. We take a glance at the less-than-stellar aspects of someone else’s life and our mental label-makers start cranking. We hear malicious gossip so our label-maker shifts into overdrive. But you and I wear a label that trumps the rest. Made before the beginning of time by God Himself. He labeled us first. A manufacturer’s stamp, so to speak. But we’ve covered it over. Allowed others to deface it with a mustache and beard. Perhaps you’ve even tried to peel it off just because you don’t feel worthy. So how do we deal with our labels? 1. Pray. Maybe you’re not aware the detrimental labels you adhere to yourself. Ask God to reveal them to you. 2. Identify them accurately. You may struggle with insecurity, but that’s a secondary emotion. The root is fear. Fear of not fitting in, not excelling, not being “good” enough. Accurately identifying what you’re afraid of opens doors of understanding. 3. Seek help. You may uncover serious issues under those labels that may go beyond your capability to properly work through. Seeking advice or guidance from a pastor, counselor, or support group may be in order. 4. Put on the Teflon of God’s Word. When we view ourselves through God’s love and forgiveness found in His Word — finding our peace and contentment in Him alone — we discover that other labels won’t stick for long. Filling our mind and heart to overflowing with His rich truths from Scripture leaves no room for mislabeling. God’s labels don’t change. You are always loved by Him — regardless of what you’ve told yourself or heard from others. In Christ, you are His priceless treasure and dearly loved child. Worth spending eternity with Him. As the Manchester bombing victims slowly move toward recovery, pain piles high next to the debris. Heartbroken parents who will never again nuzzle their child’s hair. Children never again hearing a favorite bedtime story from mom. The widowed wife who rolls over to greet an empty pillow. What can we possibly say that will make things better? 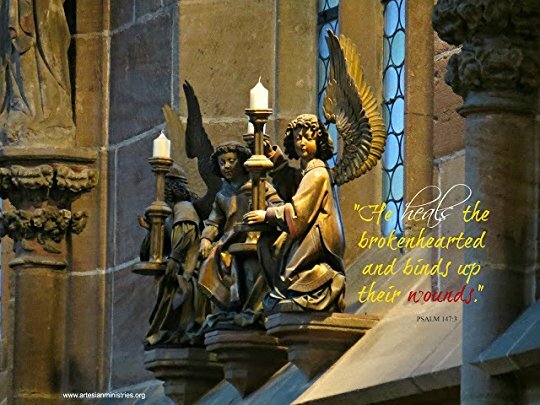 When unspeakable loss crumples a heart to its knees hard, deep grief doesn’t hear well. They experience devastation deafness, so to speak. I’ve been there. Felt that. 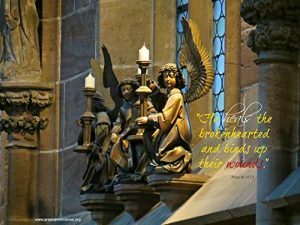 This tragedy caused me to reflect on how I initially comfort those who grieve. Am I helping or hindering? So often at funerals, well-intentioned people launch feel-good speeches at a grieving person about how God has a plan. How He will bring good out of their loss. That through adversity, God provides opportunity for faith to strengthen and grow. There is a right time and place for those truths. But it’s not during the funeral. Devastated hearts need someone to sit in the mud and cry with them. Or a strong shoulder to lean against when their knees tremble weak. Or a comforting hug expressing love in a thousand silent ways. And lots of prayers without ceasing. And He is faithful to do exactly that. So if someone in your life has suffered a deep loss, perhaps save the words for later — when lessening degrees of grief allows them to actually hear the comfort. Until then, just show up. When it comes to Bible study, I admit that it used to scare my freckles white. As a new Christian 25 years ago, my Bible’s table of contents was a lifeline to find my way around Scripture. 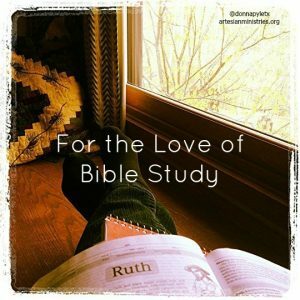 How do you view Bible study? Frustrating, fulfilling or downright frightening? Much like a car’s GPS, effective Bible study tools often spare us the discomfort of getting lost in Scripture. Because who likes getting lost? (1) Shelve your study Bible. Don’t discard it, just shelve it initially. Get a Bible that contains only Scripture cross-references. Look up the cross-references to help you interpret and navigate through Scripture. Comparing Scripture with Scripture lets the Bible explain itself, allowing God’s context to speak. Treat study Bible notes as what they are: commentary, and a brief one at that. Remember they are man’s words, subject to bias and error. Read them respectfully but critically. Ask God for insight as you begin studying His Word. Humbly ask God to reveal truth to your heart and mind as you read for understanding on your own. Ask again as you compare your discoveries to those of trusted commentators. Even if you discover that you may have drawn an inaccurate conclusion from a passage, your diligence to discover the correct interpretation will cause you to remember more readily. This journey is vitally necessary for spiritual growth. Study notes serve as a starting point, not a terminus. Once you have read the passages for personal understanding in a note-free Bible, consult several study Bibles and commentaries from trusted sources. Look for consensus and disagreement among them. And keep those prayer lines open with God as you go. There are others, but I usually use the above resources each time regardless. Just remember, those study tools serve as a reference point for your conclusions, but not as a substitute for them. And don’t be afraid to get a little lost in Scripture. Allow yourself to feel the extent of what you don’t understand. It’s a humbling feeling. If wisdom and understanding define your destination, humility makes an excellent starting point for the journey. 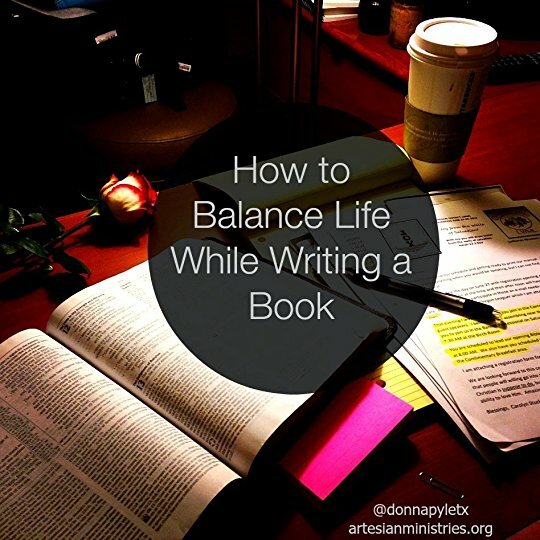 How do you view and/or approach Bible study? Comment below and let’s learn from each other’s tips and study methods. We’re on this journey together! Here are four different Bible Reading Checklists to choose from. Tuck one (or all) neatly in your Bible for marking your study journey. Please feel free to share them. He was supposed to be out with the army. That’s what 2 Samuel 11:1 says about King David. But he decided to stay home. He took a stroll along his rooftop and saw a beautiful woman taking a bath. And the rest, as they say, is history. David lusted. Bathsheba succumbed. David ordered Bathsheba’s husband murdered so he could marry her. They had a child. All seemed well. But God did not forget what took place. The price of David’s sin was the life of their child. So much collateral damage from one person who thought he was above reproach, the law, or reprimand. Are you and I any different? Adultery plagues our world today. Whether you have been victimized by it or know a family member or friend who has suffered a wayward spouse, infidelity affects us all. Infidelity frays the fabric of families. Teachers feel the effects in their classrooms when kids act out or grades slip as they process the emotional hurricane caused by their parents’ divorces. Pastors’ and counselors’ schedules stay full as they walk the victims of adultery toward God’s healing. I don’t use the word victim lightly. That’s what adultery feels like. The one person to whom you opened your heart, body, and mind decided on some level that you were insufficient. Whether that insufficiency stems from within or is persuaded from without, it decimates intimacy. Adultery ranks among the top significant hurts that are the most difficult to forgive. But that’s not news. The real news is that “victim” is not our identity when we are in Christ. And if we are in Christ, forgiveness is not optional. Ugh. Believe me, I understand how much that stinks to hear when you’re sleeping single in a double bed. Forgiving the deep betrayal of adultery seems impossible. How do you even begin such a daunting process? I asked that question several times. When our emotions are screaming for vengeance, entertaining thoughts of forgiveness seems impossible. But as God’s children, we do not operate in our own strength. 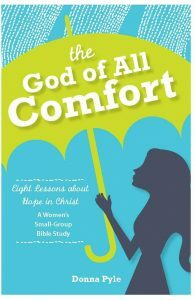 If you’ve experienced adultery, you will feel weary and faint. But rely on HIS strength. People question when I say, “Through gritted teeth, I asked God to help me forgive my ex-husband.” That’s because forgiveness is an intentional act of the will. 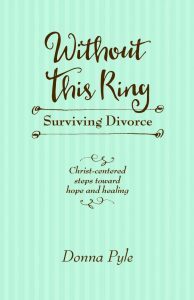 When I kept asking God to help me forgive my ex-husband instead of dwelling on his actions, God focused my thoughts on Him, not the hurt. God sets our heart right when we focus on the Lord and surrender toxic emotions to Him. (Colossians 3:2, Proverbs 3:6). So how do you walk toward forgiveness? Begin with prayer. Pray for God to heal your shattered heart and mend your broken spirit. Over and over and over. It may seem as if you’re trying to convince yourself that you’re worth such love. God says you are. Healing takes endless hours poring through Scripture. The verses God used powerfully in my life during that time were Psalm 18:16–19. No matter our hurt, its depth or its breadth, God rescues us. Why? Because “He delighted in me.” That’s it. No other credential necessary. Your worth is not stained by those who hurt you. Your lovability factor is not decreased by his or her actions. You are completely and wholly loved by God regardless of external circumstances. When we endure painful seasons, knowing that Christ is our strength gives purpose to our pain. God never wastes a hurt. He will use that brokenness for our good and His glory. Forgiveness doesn’t let them off the hook. Forgiveness frees you from the narrative of hate. Ask God to help you forgive your adulterous spouse. Not because God doesn’t hear you, but to keep your focus on Him. In Christ alone, you will find hope, healing, and the strength to forgive. 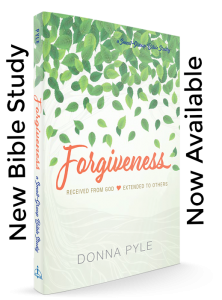 *This post is an excerpt from my new book, Forgiveness: Received From God, Extended to Others, available now.